"Vanessa Strickland, who animates Dr. McNuthin, does a fabulous job of investing the red-pantsuit-clad dummy with drawling, a domineering personality." "Puppeteers Vanessa Strickland (who steals the show when she brings Carol Channing to life as a trash-talking therapist), Luke Cieslewiscz, and KyoSin animate [the dolls]... the effect is alarmingly successful." 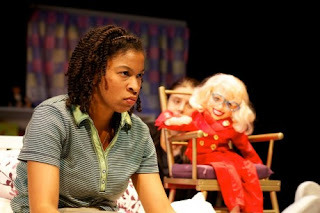 "Vanessa Strickland shines as Dr. McNuthin, a foul-mouthed Carol Channing ventriloquist doll with psychiatric leanings." "However, the show belongs to Maya Jackson who gives a revelatory performance as pregnant teen Holly and…a Carol Channing puppet voiced by Vanessa Strickland... Dr. McNuthin gives Holly the adult guidance she desperately is seeking and... Strickland excels with bringing it to life. Her comedic moments and vocal inflections are priceless. Without someone as strong as Strickland in the role, the puppet could have been too much of a one-note joke, but Strickland made it work. Really work." 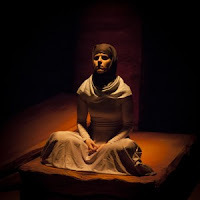 "Vanessa Strickland gives a stellar emotional performance as Antigone, and her face tells the story of the hardship a sister must endure to bury her brother. Time and places change but the pain of war remains – and Strickland displays this to the audience flawlessly." "In the title role, Vanessa Strickland cuts a striking figure of strength forged from unshakeable convictions about right and wrong." "[The] roles were perfectly cast... the wonderful Vanessa Strickland as the innocent Mina who, although taken aback by her friend's tales of amorous escapades, secretly loved hearing about them... One chilling note: When the young Mina is taken over by the spell of Dracula, her slow, demonic contortions were horrifyingly reminiscent of 'The Exorcist.'" "The audience is immediately thrown into Alex's world through violence -- elegantly choreographed fight scenes that sometimes border on dances, orchestrated by fight captain Vanessa Strickland." "Vanessa has a rare ability to consistently put her full attention and presence into what she is doing, which translates to exceptional work ethic." Her keenness to the moment results in a remarkable ability for improvisation, as well as a genuine aptitude to listen and recieve (and do her part to achieve) a director's vision. Perhaps most notably, she is able to do all of this in a spirit of playfulness and without taking herself too seriously, which is a breath of fresh air for a director." "What was immediately apparent about Vanessa was her amazing preparedness and willingness to work. She is thorough, generous, and attentive... What is fun is that somehow she is able to anchor the rest of the group, to be that one whom everyone can count on, and to unintentionally inspire others to be more fully invested..."
"Vanessa was able to bring out her character subtleties, conflicts, and paradoxes with merely a look, a pause, or a simple gesture, in such a way as to command the eye of the audience and evoke compassion. This is a rare skill she has- to be able to communicate succinctly and with depth at the same time. She is able to fully embody the characters and sustain them with an honesty that is unparalleled. We submit our highest recommendations for Vanessa Strickland." "As an actress, Vanessa Strickland is detailed, imaginative, daring, and has a certain magnetism on stage which is brought out by her honesty and dedication to the character. It is no surprise then, that her other professional pursuits reflect this in every way. The epitome of team player, Vanessa is extraordinarily reliable, executes each task to the tee, and always puts her own ego aside. Constantly drawing out the positive, Vanessa can be innovative at times when resources are few. Anyone who is lucky enough to hire her will get an investment that pays ten fold." "Vanessa was a joy to work as the lead actress on my latest film, Broken Wings. She was very prompt, professional, courteous and I couldn't have been more pleased with her compelling performance. Her make-up skills and creature design also bumped up our production value significantly. At the risk of losing one of Baltimore's best kept acting secrets, I highly recommend Vanessa for any film or theater projects you may have." "I had not worked with Vanessa prior to Ma Lien. I cast her based on the performances I saw on her website and from the recommendation of a fellow colleague, and I could not have been happier! Vanessa brought a level of professionalism to the show, entering rehearsals prepared and with a positive attitude that the other actors stepped up to. I felt confident giving her notes as well as letting her take the characters on their own journeys, knowing that she would hear what I was asking for and turn it around into something exciting and creative. 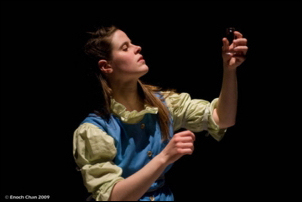 She had a constantly engaging stage-presence and a conscious playfulness, which was critical for this children's show. I would welcome the opportunity to work with Vanessa again on any side of any theater's curtain." "Ma Lien and the Magic Paintbrush"
"It was excellent working with Vanessa, as she provided equal parts professionalism and energy in her acting abilities. Despite the arduous task of repeated takes, she was on her mark consistently each and every time, and was a pleasure between shots as well. I admire her talent, skill, and experience, and will look for any opportunity I can to work with her in the future!" 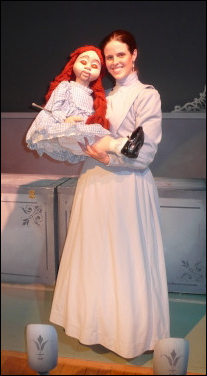 "Vanessa was not only a skilled puppeteer, but she was an excellent teacher to the other performers. Her voices and characterizations enthralled our young audiences and she was engaging and patient when interacting directly with children after the shows. I hope to work with her again!" 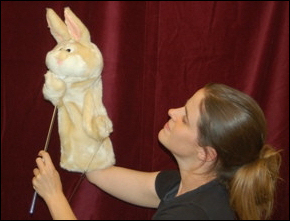 "Vanessa was with the Puppet Co. as a lead performer for our 25th Anniversary season. Her more than a dozen roles ranged from Titania in A Midsummer Night’s Dream, to Alice in Alice in Wonderland, to Mother Wolf in The Jungle Book, and many more. Each role required the use of a different kind of puppet, and a different kind of characterization." "Vanessa approached each role with understanding and the kind of diligence that’s necessary when you're manipulating what might be a very heavy puppet in a very long show. 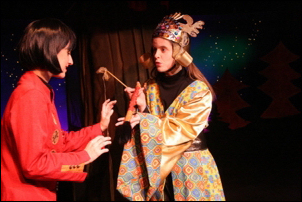 Vanessa has been a genuine asset to the Puppet Co. as a performer and a friend." "I first began working with Vanessa in the summer of 2004. We corresponded quite heavily by email for months before ever meeting one another. Vanessa's ability to handle business on behalf of her business associate, in regards to a project she knew second hand was truly inspired. She continues to impress me with her work on all sides of the curtain." "You are a VICIOUS actress!"